Jewish Home faction will not vote with coalition until Eli Ben Dahan reinstated as deputy defense minister. 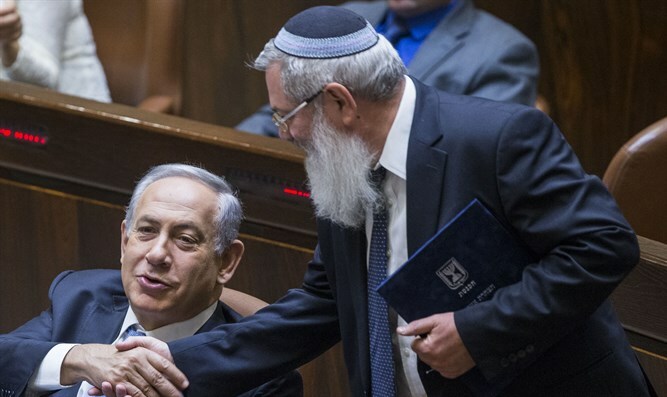 The Jewish House faction announced that the party would not vote with the coalition until MK Eli Ben Dahan was reappointed as deputy defense minister. Prime Minister Netanyahu's office said in response that "the role of Deputy Defense Minister Eli Dahan will be dealt with in the coming days." "The political crisis caught me in the midst of important work on many projects, for reservists, disabled IDF veterans, residents of Judea and Samaria and many other issues," Ben Dahan said in response to the failure to reappoint him as deputy defense minister at the cabinet meeting. "My activities at the Defense Ministry do not relate to the future of the coalition, as it does not relate to the work of the other ministers, and the technical process can only be carried out by telephone."